While SIHH 2018 had no shortage of unveilings that were heavy on dramatic significance (multiple watchmakers celebrated anniversaries, centennials, milestones — the list goes on), the addition of Hermès to the exhibitors’ lineup struck many as the most interesting development. The French fashion house — better known for superlative leather goods and perfumery — took a measured approach to its SIHH debut, favouring watches which emphasised its history of award-winning visual design and expertise in the traditional decorative arts. Notable among these was the new Carré H: a distinctively shaped model originally released by Hermès in 2010. 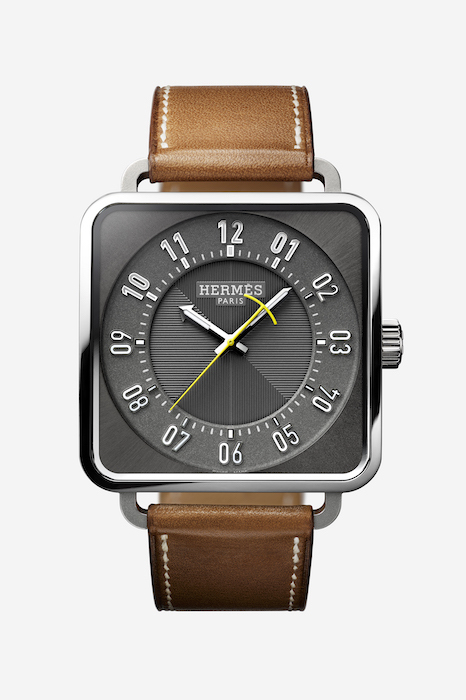 For its SIHH debut, Hermès enlisted the help of award winning designer Marc Berthier. 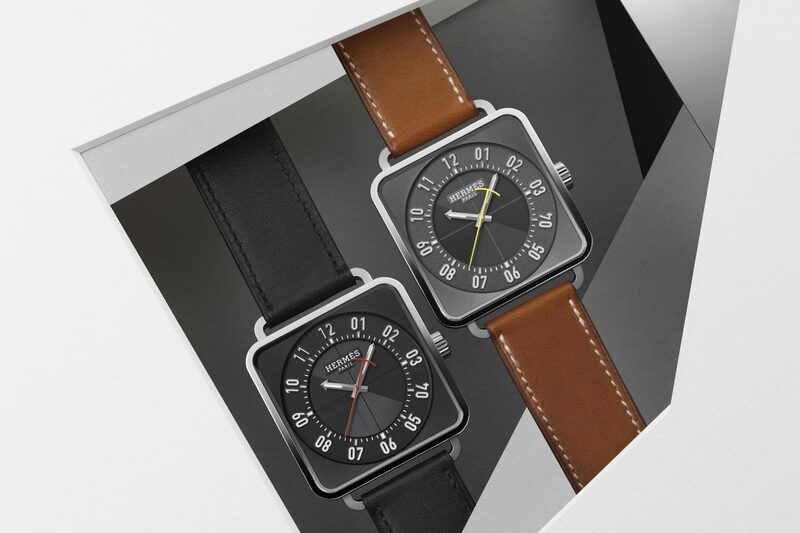 The result is the rare shaped watch — offered by a major fashion house no less — that works. Originating from the house’s creative partnership with furniture designer Marc Berthier, the revamped Carré H embodies the idea of watches as pure design objects. To that end, the focus here is on shape and geometry — qualities which Berthier has explored for decades in various other award-winning formats. The revamped Carré H features a 38mm x 38mm case which Berthier designed with a curved back, helping the watch sit relatively close to the wearer’s wrist. Admittedly, at the aforementioned dimensions (plus a thickness of 3.7mm) the overall profile is likely to wear prominently on most wrists. The Carré H capitalises on 2018’s segmented dial trend with a unique take that integrates two seemingly opposed shapes. The second variant of the Carre H, featuring a hyper-visible seconds hand and grey dial. Both versions of the dial (grey and black) are divided into three sections comprised of: a centre disc; chapter ring; and outer square. The juxtaposition inherent in such a layout (i.e. empty corners versus the more traditional circular “dial”) is likely to divide design lovers — and with good reason. Berthier reportedly stated that combining the dial’s circular and square segments was crucial to the overall design; and that getting the balance (between symmetry and instant legibility) right was a uniquely difficult task. While the Carré H’s profile screams pure Berthier, Hermès’ influence is discernible in the various details which decorate the case: the centre disc sports guilloché in a criss crossing pattern; seconds arms are executed with whimsical pops of colour (green or red); and the indexes were designed in a font that is exclusive to the French luxury house. By no means a complicated mechanical watch, the Carré H nonetheless boasts a native movement that charts steady progress for in-house manufacture at Hermès. Though primarily banking on its sophisticated design, the Carré H nonetheless boasts an original movement thanks to manufacture Vaucher. Hermès acquired a 25-percent stake in the Fleurier-based factory in 2006, and immediately put its new acquisition to work on in-house calibers. 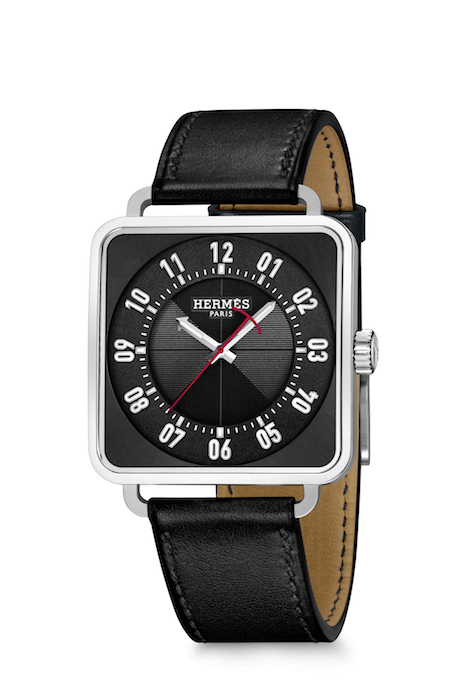 The H1912 is one of two prominent examples of Hermès’ evolving capacity for mechanical watchmaking. Originally developed for women’s watches, it’s a straightforward, time-only calibre backed up by a two-day power reserve and ample amounts of hand detailing. Mounted in an exhibition-style caseback, wearers are able to view the signature “H” patterning that covers the H1912’s plates, bridges and rotor. 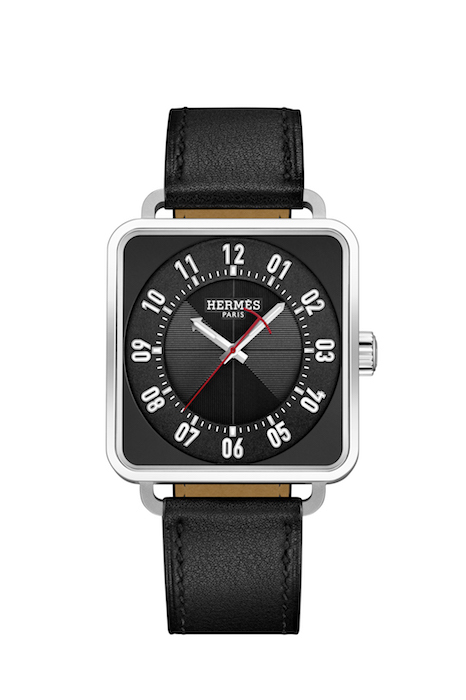 The re-release of the Carré H confirms an obvious truth: that Hermès is determined to pursue fine watchmaking in the long run — albeit on unique terms. The brand’s debut at SIHH retains the core elements that make their products great (e.g. wider product synergy and world-class design) whilst showcasing gradual improvements on the technical front. Horology traditionally isn’t at the cornerstone of the Hermès identity, but with designs like the Carré H, it one day very well could be. The Carré H is priced at approximately US$7,725. For more information, visit your nearest Hermès store.